Please check the software release date before updating your unit. This update is only required if the release date is the same, or earlier than indicated in the screenshot. 2. Select the field "Settings"
Before proceeding with the Map Update itself, the NVE-M300P needs to be prepared. 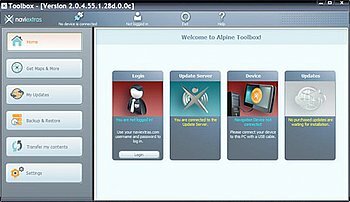 Download the “NVE-M300P TTS Manager Tool” and extract the file on root directory of an empty USB stick (folder “M3” needs to be in root directory of the USB stick). “NVE-M300P TTS Manager Tool”, folder “M3” in root directory of the USB stick. 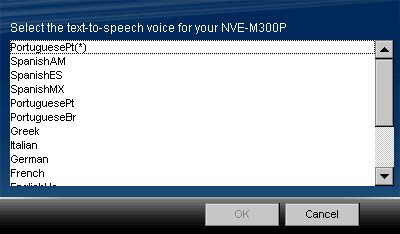 The “NVE-M300P TTS Manager Tool” starts up. 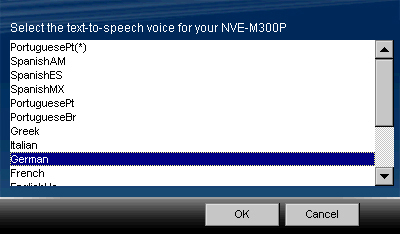 All TTS voices marked with (*) are stored on the NVE-M300P unit. 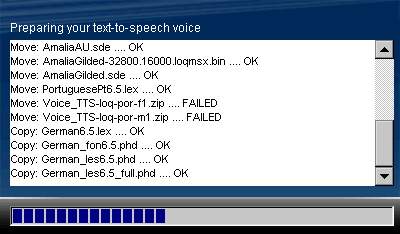 Select a TTS voice of your choice and press “OK”. The selected TTS voice will be available for navigation. All other TTS voices are transferred from NVE-M300P to USB stick. This process takes up to 15 minutes. CAUTION: If you consider changing the TTS voice later on, the USB stick must be kept as a backup. Once the TTS voice preparation is finished remove the USB stick. NVE-M300P will restart automatically. 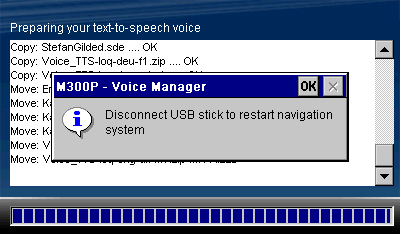 All TTS voices, except your selection, are located on “USB stick\\NVE_M300P_Voices” as a backup. 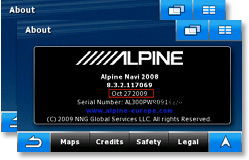 Alpine.naviextras.com is the official map update portal for Alpine. 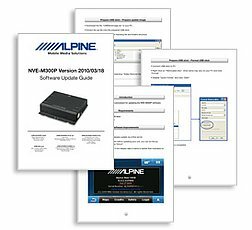 Some alpine.naviextras.com site features, including buying updates, require that your device is registered. Please register your NVE-M300P and your required personal data within Naviextras Toolbox, which is a free PC-tool. 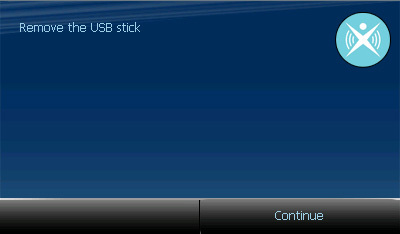 The navigation map update of your NVE-M300P is done by USB stick. 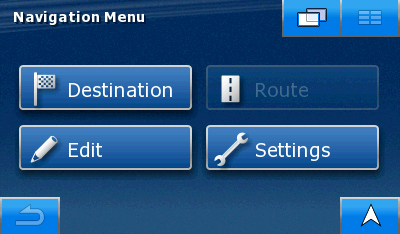 This allows easy transfer of the map update to your installed navigation module NVE-M300P. During the update only revised or new content will be transferred from the USB stick. Download <<MU_NVE-M300P_xxxxxxxx.zip>> to your PC. Extract the file (i.e. with WinZip/IZArc) onto the USB stick. The folder “M3” has to be stored in root directory of the USB stick. 1) Power on NVE-M300P by turning on the ignition. 2) Connect the USB stick via the USB cable included in the box to NVE-M300P to start the synctool. 3) Press the “Collect device information”. 4) Press “OK” once Update or Backup successfully completed without errors. 6) Press “Yes” to quit synctool. 1) Start Naviextras Toolbox and connect the USB stick to your PC. The prepared USB stick will be recognized as navigation device. 2) Purchase and install content and updates as described within Naviextras Toolbox. 3) Safely remove the USB stick from your PC. stick via the USB cable included in the box to start the synctool. 2) Press “Copy updates to your device”. 3) Press “Yes” to initialize the update. The following information is quite important for the service handling if you opened an account at Naviextras.com and purchased additional updates for your NVE-M300P, in addition to the original installed software package! The NVE-M300P creates an individual software identification number called SWID, during first boot up of the system. This software identification number will be transfered to Naviextras.com while you purchase an update for your NVE-M300P. This is made in order to guarantee Copyright protected issues. Your device and your account for this device will be recognized on your next visit at Naviextras. Alpine Service are using PDF fomat for these forms and would firstly like to explain how these forms should be completed, for those of you that do not have acrobat installed on your computers these forms can be completed using Acobat Reader which is available as freeware, here is a link to download Acrobat Reader, Reader 9 or above will be required for these forms: (Adobe Reader X (10.1) will be needed for .pdf with embedded videos).. Your dealer/your service station exchanges your NVE-M300P to another one. The service replaced the Main PWB. Your NVE-M300P needs a complete re-installation of the firmware and software. Therefore please note your SWID and fill out the attached form if your NVE-M300P needs to return to our service department and you have purchased additional software for this device. Unnecessary, if your NVE-M300P has still original software package on it. Please download the file and open in your Browser.